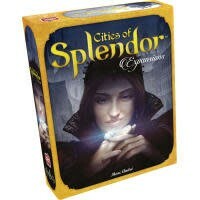 Cities of Splendor introduces four complete expansions to the Splendor base game, each accentuating and highlighting a different aspect of the original game. Towers allow players to reserve additional cards, special powers introduce a new layer of engine building, cities give players a new goal to strive towards, and a range of exciting development cards add spice to any game. Each of these four expansions offers a completely unique approach to the game of Splendor without compromising the game`s original elegance.